If you’re anything like us you have a kitchen counter full of zucchini also called courgette and wondering what on earth you can do with it all. I have a sweet suggestion for you! You can make these outrageously moist low carb chocolate frosted zucchini brownies and no one will ever know they are healthy. The zucchini we used for this recipe were organic and full-grown so we removed all the skin which tends to be tough and grated it using a box grater. This is a simple way to make sure none of the mature seeds get into your zucchini brownies. The shredded zucchini gets lost in the chocolate brownie batter which is a cake-like consistency and no one will even know it’s there. You can’t even taste it. The main role of the zucchini is to keep cakes and brownies moist. 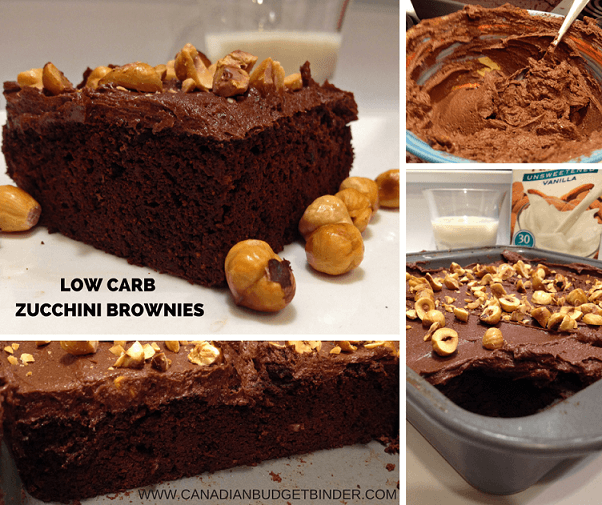 What you’re left with is a healthier option for a cake brownie that you won’t have to feel guilty about eating. My wife likes to store a pan in the freezer so she always has them on hand when she is in the mood for chocolate. She says they are perfect and hit the spot especially with a hot cup of coffee or tea. Our two-year-old son is a picky eater and that’s not a secret as I’ve blogged about it on many occasions because it can be frustrating as a parent. It can be difficult to get him to eat anything because he loves his milk more than anything in this world. Not only did we teach him how to say zucchini this week but he gobbled up these super-moist zucchini brownies without hesitation. I know that chocolate might have been the driving force but he’s tried some of our low carb desserts before only to say, yuck and spit it out. Not this time and that’s how we knew we had a winner on our hands. 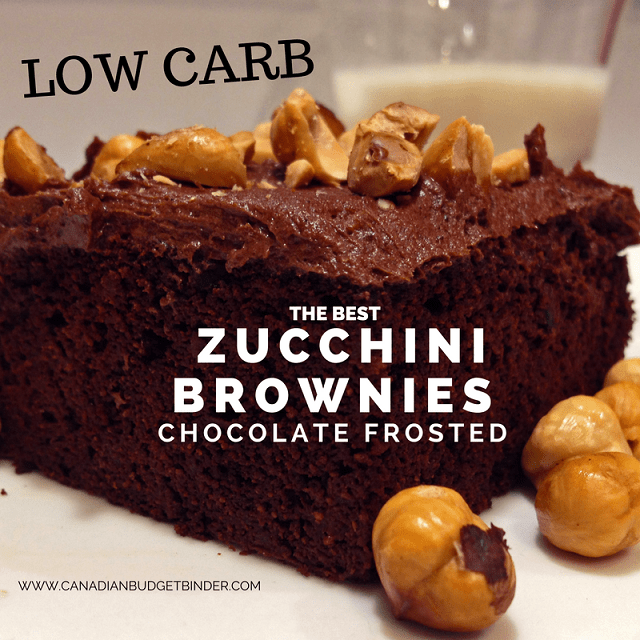 What is great about these low carb zucchini brownies are that you don’t have to add chocolate frosting to the brownie. These zucchini brownies are perfect naked on or with a thick sugar-free chocolate buttercream frosting. This recipe is perfect either way, with or without chocolate frosting. It has been almost one year since my wife decided to embrace the low carb lifestyle and with that we’ve experimented with many recipes. We’ve had failures and many successful low carb recipes created in our kitchen. 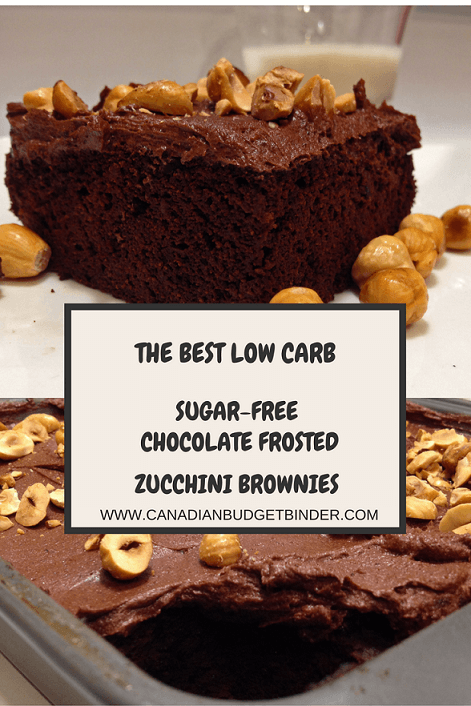 These sugar-free chocolate frosted zucchini brownies top the low-carb treat chart and one that my wife says she’ll be making over again. They are perfect when you want your chocolate fix without any of the sugar. The secret to making the zucchini brownies moist and thick is to leave the shredded zucchini over-night wrapped in cheesecloth or paper towel to drain. Zucchini are mainly water so you’ll want to soak as much of it up as you can so it leaves you with gorgeous shreds of this wonderful vegetable. 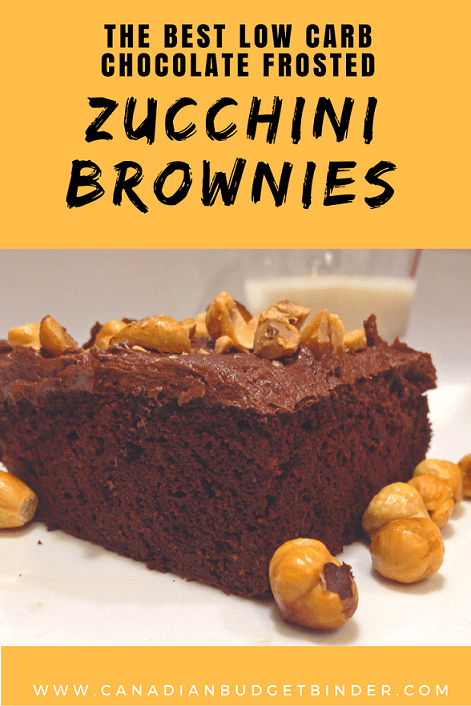 You don’t need a stand mixer or any fancy gadgets to whip these zucchini brownies up but you will need a coffee grinder to powder your erythritol which is a low calorie sugar substitute that tastes like sugar, but it’s not. Erythritol is a natural sugar that tastes like sugar but with no side-effects. You will pay about $11.00/lb for it at the Bulk Barn but it’s worth it. Once the zucchini brownies were cooled I whipped up a simple sugar-free buttercream frosting and toasted some hazelnuts for topping. You can leave the nuts off if they aren’t your favourite but we like the nutty flavour and texture they give to these zucchini brownies. Note: When making the sugar-free buttercream chocolate frosting that if you opt to use Splenda instead make sure to get the fine grind or use a coffee grinder to grind up your sweetener. If you don’t you will have a gritty texture to your buttercream frosting. Take it from us, we’ve experienced it and it’s not as enjoyable but it doesn’t ruin the flavour at all. 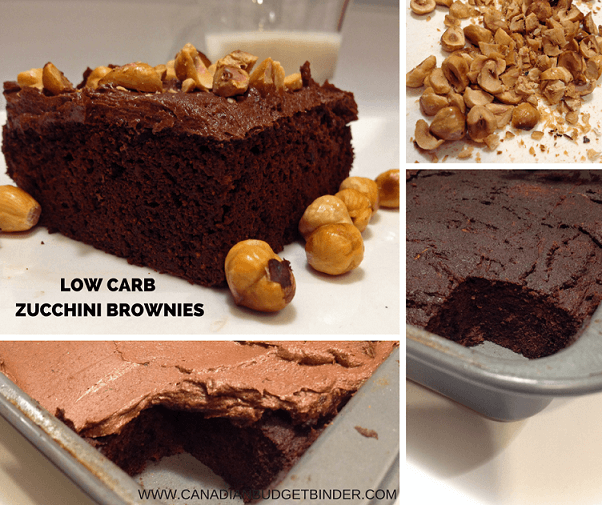 There is healthy zucchini buried into this moist low carb brownie topped with a sugar-free chocolate buttercream frosting and toasted hazelnuts. Nobody will even know it's there. ½ large zucchini shredded (2 cups shredded) drained and sat overnight covered in cheesecloth or paper towel. Pour into prepared baking pan and bake for 20-30 minutes or until a toothpick comes out clean. Do not over-bake or it will become dry. Add unsweetened almond milk by the tablespoon and mix until you get a fluffy thick consistency. Taste for sweetness or adjust to taste. Store in the refrigerator for up to 3 days or in the freezer for 3 months. Always de-frost for about an hour before serving. Once your zucchini brownies are cooled and frosted you can add chopped toasted hazelnuts to the top like we did but this is optional as is the frosting. They are still a wonderful sweet treat without either. Each zucchini brownie without frosting has 2.8 carbs. At the end of the day everyone deserves a sweet treat even if it is full of hidden zucchini, low-carb and sugar-free. Living a low-carb lifestyle doesn’t mean you can’t enjoy the sweetness that you gave up for healthy living. Let us know what you think or any changes you made to the recipe to adapt it to your own. WOW. That looks so delicious! 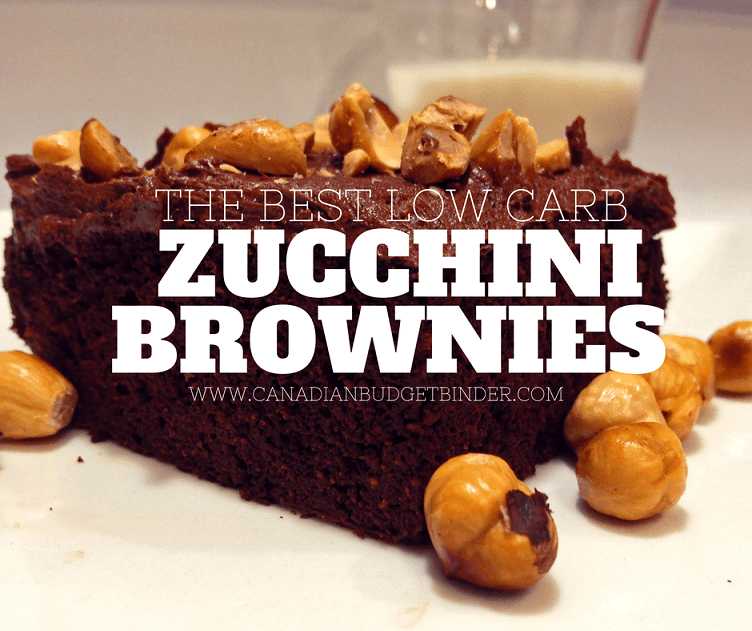 It’s really possible to make zucchini brownies with low carbs! This does look yummy!! Reminds me….I have my SIL’s recipe for a chocolate zucchini loaf and a zucchini sitting and waiting for me to do some baking as things are finally cooling down. I have been craving baking but it’s been too hot to use the oven here with no AC to help cool things down.